- waiting for new announcement. 07.00 - 07.30 am Pick up from your hotel ans transfer to the “Boat Ramp” Pier. 09.00 am Depart from the “Boat Ramp” Pier to Phi Phi Island. 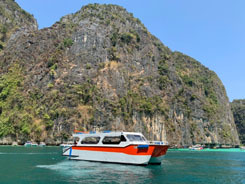 - Discover “Maya Bay” World Famous in the movie “The Beach” starring “Leonardo Dicoprio” , sunbathe on the beautiful white sand beach fringed by dramatic limestone peaks or roam jungle paths among chattering birds into Luh Samah Bay. - Be awed as we solely cruise to pileh Cove and swim in the amazing natural pool, surrounded by cliff formations, otherwise known as the “Emerald Lagoon” and next explore “Viking Cave” , “Monkey Beach” offers another highlight, and you may even have a chance for a monkey selfie. 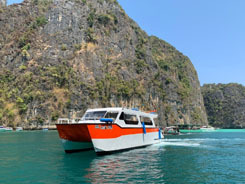 Enjoy a sea viw buffet lunch served at phi phi don island. - Relax 1.30 – 2.00 hrs at “Bamboo island” where you can sunbathe again in the white sand beach or snorkel over the coral reef and spot a variety of sea lift. 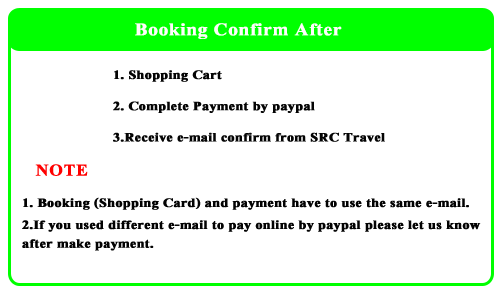 - Arrive at the harbor around 4:45 pm to 5:15 pm , with the safe journey and transfer back to your hotel.